Simmons Beautyrest Black reviews are a mixed bag. 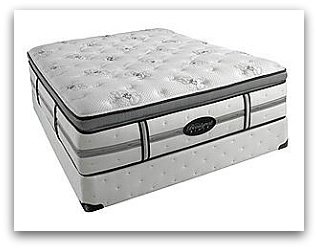 By many accounts they are among the top luxury mattresses available. But there have been quite a few horror stories as well. 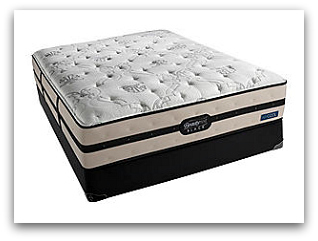 If you're not familiar with them - this is Simmons top of the line luxury mattress. They feature a number of layers that should help you sleep great. 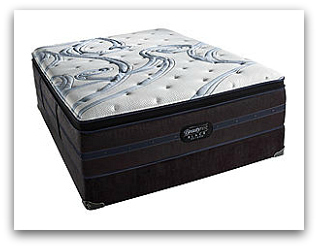 Memory foam is used in the line to give it's users the comfort that only visco elastic foam can provide. This is Simmons NxG memory foam, which is a state of the art material. This mattress also uses a modal yarn and Cashmere blend in the outer layer, which is a nice material and enhances the look and feel of the upholstery. However, once you put your mattress cover and sheets on your bed it probably makes little difference. The Transflexion comfort technology and variform advanced pocketed coil springs are more important since they're involved in the support layer which largely determines the overall feel and durability of the product. The Phenomenon of "Mattress Speak"
Transflexion? Variform? This is a great example of what I like to call "mattress speak". It's like they're inventing a new language. Manufacturers constantly come up with these nonsensical made up words in order to either impress or confuse the buyer. Maybe both. I don't know but they're usually just fancy terms for regular old mattress components like spring coils that have been around for 100 years. Maybe they're trying to make things sound new and exciting. In any case I think it's just plain silly. Mattress shopping is difficult enough without confusing things further with "mattress speak". This is a nice mattress to have in your bedroom, but one thing to consider before making this purchase is the price. 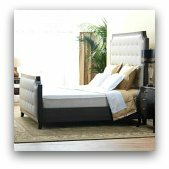 A Simmons Beautyrest Black mattress can cost up to $8000, so it really depends on how important comfort is to you. If you are a light sleeper who can't seem to get a good night's sleep, then this might be a good investment if you can find a good deal on one. If you are one of those people who can sleep anywhere, the price might be a little steep. 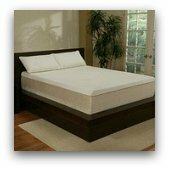 Some people have found that the mattress begins to dip rather significantly after a short period time. There have been reports of everything from minor body impressions to a large crater developing in the mattress after just a few months. In general, body impressions most often develop in pillowtop models. This is because the cheap foam used by many companies quickly breaks down forming a dip. Time and again I read complaints about this. For this reason I recommend avoiding pillowtops altogether. They look and feel wonderful in the showroom but as soon as you get them home they start to pancake. The more recent products use Simmons NXG memory foam and their new gel memory foam which should be a higher quality and more durable material. However, the type of gel they're using can make a big difference. The jury's still out on the effectiveness of this newer technolgy. I haven't seen too many comments on these newer models so time will tell. For now however, I would stick with a plush or firm model. While slight body impressions are considered normal - the crater appears to be a manufacturing defect in certain models. There have also been problems with the sides of the mattress collapsing and bulging out several inches. The model that had most of the problems has since been discontinued. One thing to keep in mind is that you need to make sure your bedframe is strong enough to support the mattress. Today's mattresses are generally heavier and you can't rely on the boxspring alone to support the mattress. This is usually mentioned in the warranty. If the mattress set is only supported by the four corners and a couple of thin wooden slats that's probably not enough. If you're not sure about your bedframe you should check it before you blame the manufacturer to be certain it's not your own fault. There have been reports of Simmons denying problems and not allowing people to return their purchase which is still under warranty. Their customer service track record seems to have been less than stellar regarding this product. Many Beautyrest Black reviews state that they send a customer service rep out to your house to inspect the mattress and measure the size of the dip. In order for it to be covered under the warranty the dip has to be at least one and a half inches deep. Any less than that is considered a normal body impression and is defined as a "comfort issue". Comfort issues are not covered by the manufacturers warranty. There are several other things that can give the company an easy excuse not to replace the mattress. For instance if there is a single stain or blemish on your mattress which wasn't there when you bought it - the entire warranty is null and void. Most people don't realize this because they don't read the warranty at all. This is actually standard practice in the industry and all the major companies have similar conditions in their warranties - so it wouldn't be fair to single out Simmons in this particular case. However, I consider this practice of including all sorts of little things which can void the warranty to be one of the worst things about this industry. It's something I would like to see change but I'm not holding my breath. Therefore, it is probably in your best interest to purchase an extended warranty of some sort from the retailer. Also, using a water resistant mattress pad from day one can help to avoid stains. Spending thousands of dollars on a mattress only to have it become uncomfortable after a few months is definitely not a good investment. Despite the negative reviews that have appeared, some people have found that this is the most comfortable mattress they've slept on. These people say they'll never go back. They say this is the perfect bed for couples because you can't feel the other person tossing and turning. This is due to the independent pocketed coils. In addition, some beds can cause aches and pains because they do not provide enough support. This hasn't been an issue with Simmons luxury line because it provides an excellent level of firmness beneath the comfort layer. As you age, waking up feeling refreshed becomes more and more rare, but this mattress could help. 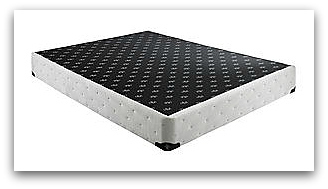 Those who enjoy their Beautyrest Black mattress enjoy it a lot. They're extremely comfortable and if you get a good one, it'll provide you with a great night's sleep. But quality control seems to be a problem. In the end, it's up to you. Unfortunately, due to the problems I've read about I can't really recommend this mattress. Overall, purchasing a Simmons Beautyrest Black is somewhat of a risk. There have been numerous reports of design and manufacturing flaws in Beautyrest Black reviews. The products that had these problems have since been discontinued but you have to wonder if more problems will arise down the line. These flaws wouldn't be as much of an issue if Simmons was quick to grant replacements or refunds, but they're not. In fact they make it somewhat difficult to return the mattresses that are still under warranty. I Believe They Call This "Getting The Runaround"
People have reported calling the company about returning the mattress and being told to deal with their retailer. Then they call the retailer and are told to deal with the manufacturer. Some people have had to fight for the return of their money after purchasing a faulty mattress. It shouldn't be that difficult to have these things taken care of - especially with an item this expensive. Even if the dip in the mattress is more than one and a half inches and the company doesn't find any stains or other excuses to void the warranty then all they're going to do is replace it with a similar model. Chances are the same thing might happen all over again. Some customers report having had to return the mattresses 3 or 4 times! What it comes down to is how important you believe comfort is and whether or not you're willing to take the risk. The company's newer Aircool memory foam system looks interesting and may be worth giving the Beautyrest Black a second chance. If you do decide to buy then stay away from pillowtops - they probably won't hold up to heavy use. Also, make sure that you find out about the store's return policy (it's likely to be better then the manufacturer's) before purchasing so that you don't end up stuck with something you can't even use. This is a comfortable mattress, but proceed with caution because of these customer service issues. If you've read other parts of this site you probably know that I'm a huge fan of Tempurpedic. I've slept one one for years and have never been more comfortable or had fewer issues with quality of construction. I recommend the firmer Contour line as I believe the heavier foam is more durable and better for your spine. Why not avoid the risk with an expensive luxury mattress when you can get a Tempurpedic Contour Supreme for $2099 in a Queen size? The only issue I've ever had with it is sleeping hot, but I just turn up the air conditioning. It looks like they've tried to address the issue with a new cooling and moisture wicking cover. I haven't used the new cover yet but would love to try it out.